New York-based Portuguese artist Nuno de Campos created a series of portraits based on short stories and novels originating in Goa. 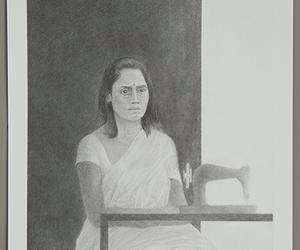 This graphite on paper, titled, ‘Goans,’ currently on exhibit at MOG, represents one or more characters from each story. He recounts his fascinating discoveries to Café. Herald Café: Are you acquainted with Goan short story writing, considering that you chose to do your project ‘Goans’ based on these writings? Nuno de Campos: After being invited to submit a proposal for the exhibition ‘Morphology of Archives’ at MOG, I started my research by reading a wonderful book of travel stories edited by Manohar Shetty ‘Goa Travels.’ Searching for more books by Mr. Shetty, I found and read in a couple of days the compilation of short stories, ‘Ferry Crossing.’ These two books offered a stark and fascinating contrast between the accounts of foreigners and the literary portraits of Goans by writers from Goa. From there, I read all the fiction related to Goa that I could find from New York, where I live. Sadly, I never had the chance to travel to Goa, but intend to visit as soon as possible. HC: How easy has it been illustrating these writings? NDC: During the course of my research, I struggled with the position in which, as a Portuguese man, I inevitably found myself. The long and fraught history of Portuguese presence in Goa became both a hurdle, and the very reason why my work could connect to an audience in Goa. At some point, it became clear that focusing on the distant past and in history, especially as it is told by westerners, would only magnify this obstacle. By working with the short stories as my starting point, I could look for remnants of the past in contemporary accounts, and think about its meaning in the present. HC: What informs your drawing process. Did you collaborate with the writers? NDC: I did not collaborate with the writers beyond the reading of the text. I looked at a lot of images and tried to have a very basic knowledge of the settings and garments. The illustrations are a personal interpretation of the stories. They reflect my understanding of the characters, which is likely incomplete, and also my personal connection with their feelings and experiences. For example, the characters Pedro (Armando Menezes ‘The Forsaken Son’) and Antonio (Nisha da Cunha ‘Home’) represent the two halves of any person who had to leave home. The emotions that define them are familiar to me, as I have myself lived away from home for 20 years now. They are also recurring themes of Portuguese culture, as Portugal is historically a place from where many people had, and still have to depart. There is a personal and a cultural connection to the characters, and all that informs the drawing process. The illustrations are an attempt to connect from a very long distance. Each drawing represents one of more characters from one story and is titled after a short sentence extracted from the text. I would like to thank Subodh Kerkar, Lina Vincent and Sabitha TP for this wonderful opportunity. I also wanted to thank the writers and editors for their inspiring work. HC: What are the other themes that have influenced your compilation? NDC: I was very interested in stories that convey traces of Goan colonialism, gender identity, families and love via an exploration of Hindu Catholic relations, class and the diaspora.